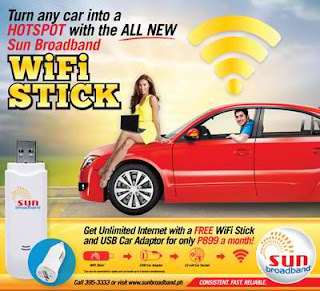 You can now turn on your car into a WiFi hotspot as Sun Cellular offers free Sun Broadband WiFi stick and a USB car adapter with unlimited internet for only P899 a month. Subscribe to Sun Cellular postpaid plan to avail these gadgets and stay always connected where you want. Continue reading below to see other available plan options for Sun Broadband WiFi Stick and USB Car Adapter. Note: You can also use WiFi Stick with a laptop and supports up to 5 Wi-Fi devices connected. To apply Sun Cellular Postpaid plan, you can call 395-800 or visit your nearest Sun Shop to inquire before availing this postpaid plan. For list requirements on applying Sun Postpaid plan you may see Just comply to their terms and conditions and complete the applications requirements indicated here.